01.10.2014 - The IAPM‘s Senior Official Udo Schmidt hosted the Metropolitan Region of Hamburg’s third IAPM Network Meeting of the year on 15 September 2014. It was attended by IAPM certificate holders and their guests. The event was also open to everyone in northern Germany with an interest in project management and publicised by the PMI, GPM and DGQ regional organisations. 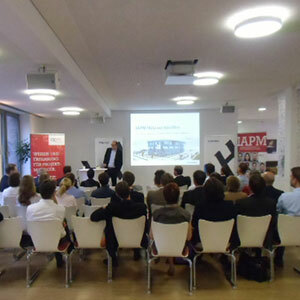 Hermes Logistik Gruppe Deutschland GmbH in Hamburg-Langenhorn provided the venue.